Primitives by Kathy kitchen dish towel bundled with Beachcombers salt and pepper shakers. 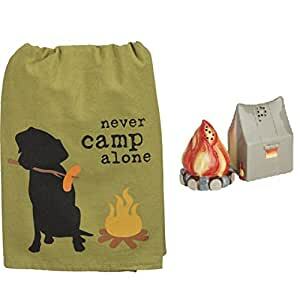 A cotton dish towel featuring a distressed "Never Camp Alone" sentiment with a dog and campfire design. Ceramic salt and pepper shakers from Beachcombers Coastal Life are shaped like a tent and camp fire.